While, we see many cosmetic products in the market for treating dry, cracked hands, most of them are full of chemicals and unhealthy. Hence it is better to get rid of these expensive products and turn your attention to easy homemade products that are natural, cost-effective, and healthier for the skin. Mix gram flour and curd together to make a paste. Apply this paste on your hands and rinse it off after 15 minutes. Mix gram flour along with coconut oil and use it instead of soap. Gram flour is a natural exfoliator. Mix a teaspoon of lemon juice and glycerin in a bowl. 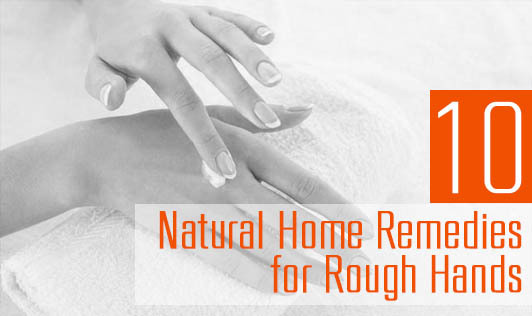 Add a few drops of rose water and apply this mixture twice a day to get silky smooth hands. Just slice a lemon in half, dip it in sugar, and rub it on your hands. This remedy will not only make your hands soft but also remove the tan. Mix some fresh cream with lemon juice. Add a teaspoon of sugar to it and massage your hands with it for 10 minutes. This will help you get rid of parched hands. Use coconut oil to massage your hands. It helps in healing cracked skin. However, make sure you don’t go out in the sun after applying coconut oil as you could get tanned. For best results, apply it at night. Just take some lukewarm milk in a wide bowl and dip your hands in it for 5 to 10 minutes. Do not wash your hands after dipping them in milk. Just pat them with a dry towel and apply a moisturizer. Do this regularly to get rid of rigid, dry skin. Boil 2 potatoes in water and mash them. Add 2 teaspoons each of glycerin and almond oil and mix it all together to make a paste. Apply this mixture on your hands. Keep it for an hour and wash it with lukewarm water. Add a tablespoon of white vinegar in water. Soak your hands in it. Do it daily to make your hands soft and supple. Mix olive oil and oatmeal together and rub it on your hands. Wait for 15 minutes and rinse off. It helps you get rid of dead skin cells and makes the skin soft. Alternatively, massage your hands with only olive oil. Mix 2 teaspoons of sugar with baby oil/vegetable oil/olive oil and massage it on your hands in a circular motion. Keep it for 10 to 15 minutes and wash off with water. Apply a moisturizer afterward. Mix ¾ teaspoon of sugar in a tablespoon of honey. Massage this mixture on your hands for 2-3 minutes and rinse it off. You will definitely get silky soft hands. Mix vinegar and onion juice together and apply them on your hands to get wrinkle-free skin within a few days.